Please share your flavour favourite! 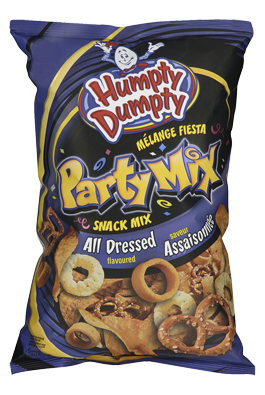 Mix it up with every handful of Party Mix- the perfect combination of fun, crunchy snacks in a fiesta of flavours! Ingredients: CORN, VEGETABLE OIL, WHEAT FLOUR, CORNMEAL, DEHYDRATED POTATOES, POTATO STARCH, SUGAR, MODIFIED MILK INGREDIENTS, SALT, TORULA YEAST, MONOSODIUM GLUTAMATE, CORN MALTODEXTRIN, SODIUM ACETATE, SPICES, ONION POWDER, MALIC ACID, ACETIC ACID, DEXTROSE, GARLIC POWDER, MONOGLYCERIDES, NATURAL AND ARTIFICIAL FLAVOUR, CITRIC ACID, SODIUM PHOSPHATE, PARSLEY, DISODIUM INOSINATE AND DISODIUM GUANYLATE, LACTIC ACID, SODIUM HYDROXIDE, CALCIUM LACTATE, YEAST, CALCIUM STEAROYL-2-LACTYLATE, SULPHITES, SODIUM BICARBONATE AND/OR AMMONIUM BICARBONATE, CALCIUM HYDROXIDE, BHT. DISCLAIMER: THE INFORMATION LISTED ABOVE IS ONLY TO BE USED AS A REFERENCE. PLEASE REFER TO THE ACTUAL PACKAGE FOR THE MOST ACCURATE NUTRITIONAL INFORMATION AND ALLERGENS.